Cirque Éloize is celebrating its 25th Anniversary in 2018. 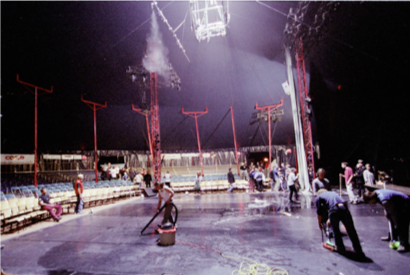 That equals 25 years of shows and innovation in the circus realm. There is much to celebrate, and co-founder Jeannot Painchaud was happy to share his top 25 moments with CircusTalk, describing the arc of the origins of the company to the thriving industry leader it is today. 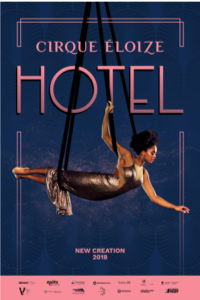 By producing a show every other year, Cirque Éloize has managed to do over 5,500 performances in 55 countries and 552 cities, according to Painchaud, who announced these statistics at a work-in-progress showing of their newest production HOTEL this past July in Montrèal during MCC. 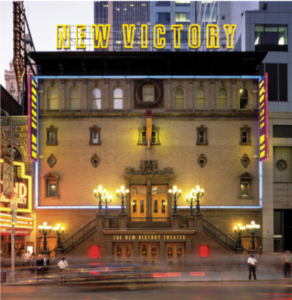 He went on to explain how 25 years of touring equaled about 130,000 hotel visits, and the company member’s collective knowledge of hotel lobbies had become the creative inspiration for the show. 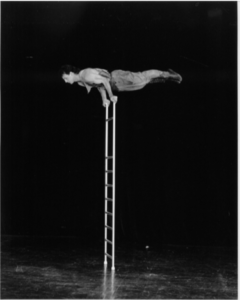 Painchaud also expressed his overall corporate goal as a desire to re-invent the discipline of circus. 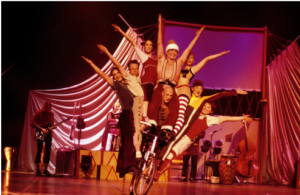 History will decide if Cirque Éloize succeeded on that account, and you can investigate that history via some highlights of Cirque Éloize right here. Cirque Éloize gave its first show for the local radio. It was the trigger for Cirque Éloize. It was then that Daniel Cyr proposed a project to Jeannot Painchaud. It was their first show collaboration– and it was the 10th anniversary for the local radio that Painchaud had worked for as a teenager. He wanted to show his family what they were doing at circus school. 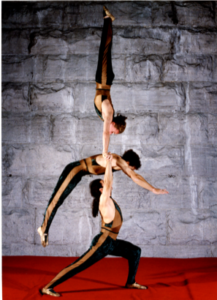 Cirque Éloize was the show name and the company was born two years later. In June 1993, a show was performed at the National Circus School (ENC) located in the former train station. This is now the current Cirque Éloize headquarters. Back then, Painchaud asked the school director if they could rehearse their show there. It was their first show as a company.”The company was really born in this building.” said Painchaud. The rising star and meteor shower happens every year around this time. 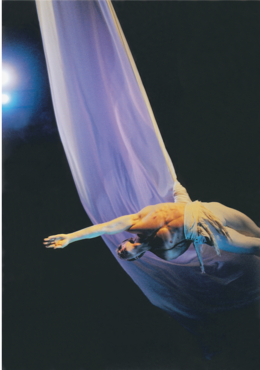 In the context of the Perseids Evenings, Cirque Éloize performed at Magdalen Island where Painchaud and co-founders originate from. 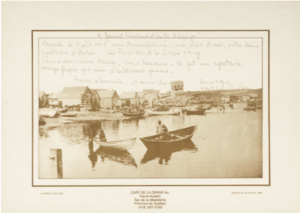 Éloize means ‘heat lightening’ in the Magdalen Islands dialect. It was a mythical evening for the company. The next morning as Painchaud drank his coffee, he read their first review in the local paper–the critic said she had to chose between two stars, the meteors or Cirque Éloize. Incorporation of the company : A dream come true. They made it legal! 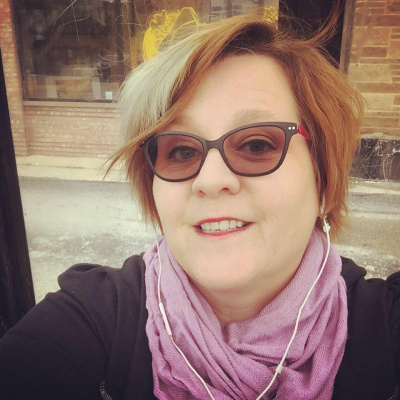 Claudette Morin was the general manager for the first five years of company–as the only business person, she really became part of the family and helped shape the company’s future. 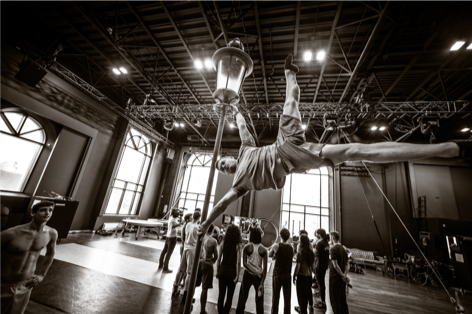 It was Cirque Éloize’s first showcase at IPAY (International Performing Arts for Youth) in Philadelphia, PA, USA. Brian Joyce, one of the presenters from Philly, saw the rehearsal the year before and invited them. There were 300 presenters in the audience, and they received a standing ovation after the showcase, booking 125 shows from that one event. That began their reputation as a circus company. That same year, Julie Hamelin, now considered a co-founder, came on board and eventually became a partner of the company. 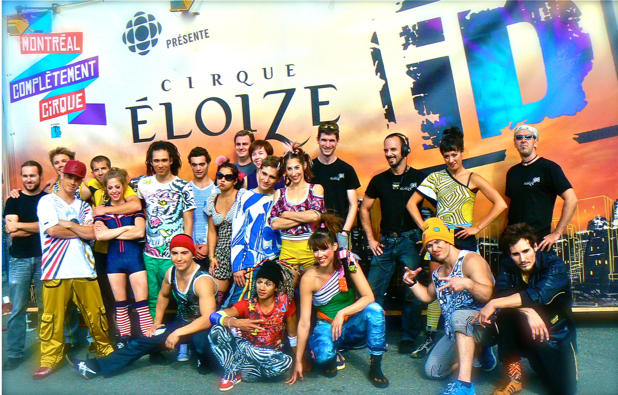 It was their Grand Premiere in Montréal with the eponym show Cirque Éloize. Although it was the third version of the same show–there were more lights, more acts, and a it was in a bigger theater. 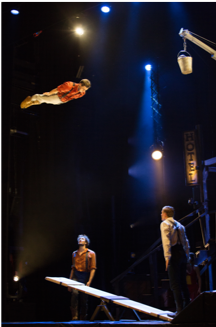 “For me this show represents the first recognition of Cirque Éloize being on stage like any other contemporary art form. We were presented in a theater so we were recognoized as doing an ‘art form’. It was the first time a circus was presented in a theater in Canada. It was an important moment for the development of the discipline,” said Painchaud. 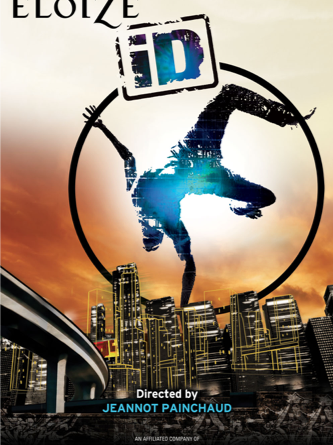 The creation of the show EXCENTRICUS for the International Cervantino Festival in Mexico was a big window into Latin American countries for the company. 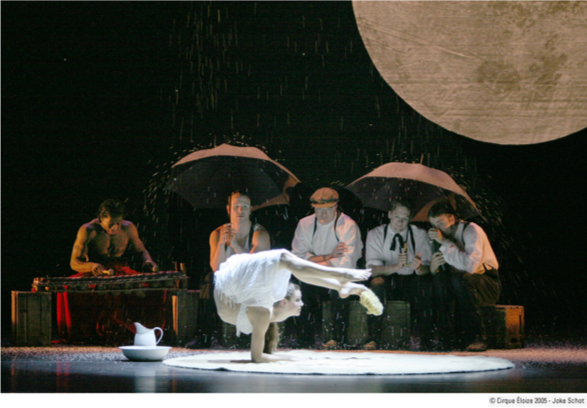 It was also Cirque Eloize’s first inclusion in an official program of a theater festival. 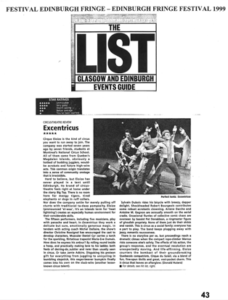 “EXCENTRICUS went to the Edinburgh Fringe Festival. For perhaps the first time in a contemporary context, the poetry of the classical music met the energy of acrobatics and the beauty of dance. 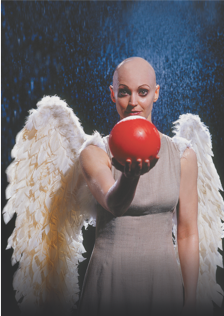 The artistic director of the Festival International de Lanaudière, along with classical music performed by the Metropolitan Orchestra of Montréal, combined their work with acrobatics from Cirque Éloize–together, creating a musical program with two choreagraphers–they called it Cirque Orchestra. Cirque Orchestra hits the Hollywood Bowl. 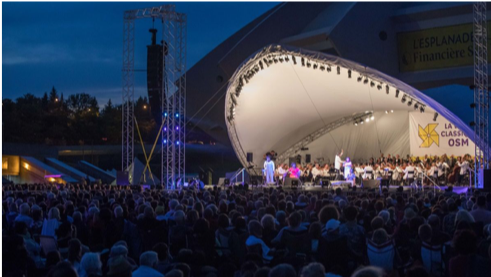 This time the show was with the Pacific Symphony Orchestra (with Miguel Harth-Bedoya) on a mythical outdoor stage in front of 25, 000 people. 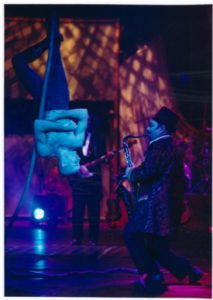 “We had between 60-80 musicians on stage, plus 16 acrobatics.” said Painchaud. 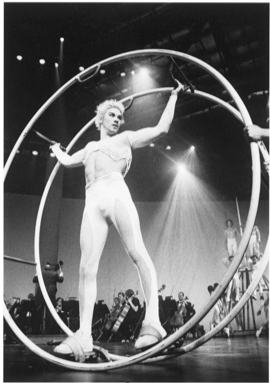 There were two hour long shows shows of Cirque Orchestra–with Alain Francouer as choreographer. Creation of NOMADE, RAIN and NEBBIA, the sky trilogy. Painchaud saw a show by Daniele Finzi Pasca and was touched and inspired. He invited Finzi Pasca to work with Cirque Éloize–and they created these three shows, inspired by gypsies, as well as the communities of Italian life and the island life–merging the imagery of the dual universes of their childhoods. Painchaud feels that these shows developed the artisty of the company. The shows toured for seven years. A big top on the Magdalen Islands? It was the first time that such a big circus show came to town and half of the population saw the show (5500 out of 11000 people got a ticket for the show NOMADE). 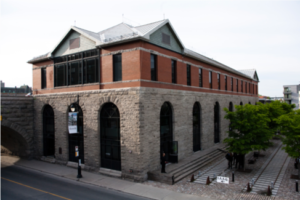 This is where everything began…the Dalhousie train station was where Cirque Éloize had its first performance, and it was also the original location of Ecole National du Cirque. 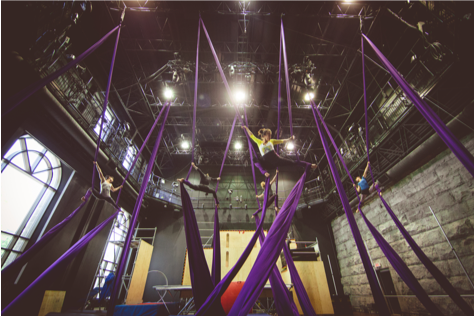 When Cirque Éloize discovered ENC was moving to a new location near La TOHU, it was their opportunity to persuade the government to give them the space. Painchaud says it was important to him because the company was born in that building. It took two years to convice them that it should stay available for the circus community. To this day it is the Cirque Éloize headquarters. 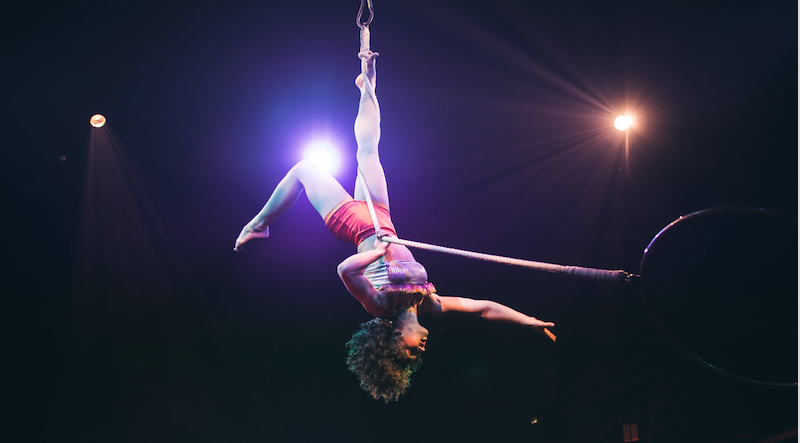 Performing NOMADE under a big top in Paris had its charms, allowing Cirque Éloize to try out a more traditional setting. 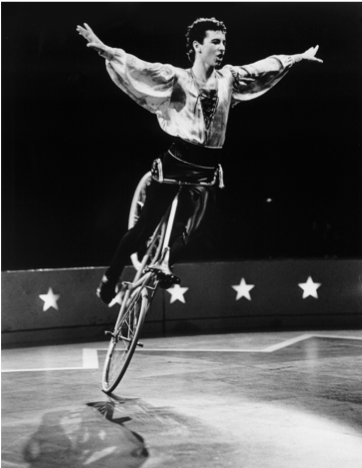 “What’s fun about this is we did contemporary circus– but our spirits were enjoying the nomadic, gypsy like experience of circus people. We had the chance to play in the big top and live in a caravan in Paris and it was such a party for a month and a half.” It was their first big run in Paris. 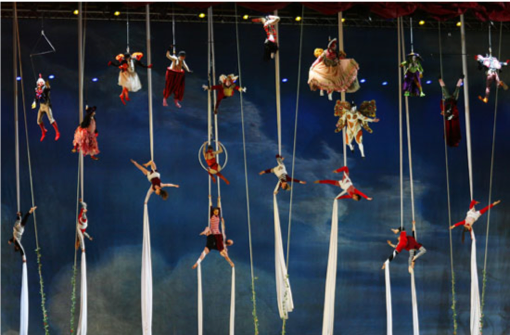 Cirque Éloize performed with Teatro Sunil in the Turin Winter Olympic Games Closing Ceremony in Turin. Back then Julie Hamelin, co-director of Cirque Eloize at the time, was already in love with Daniele Finzi Pasca. 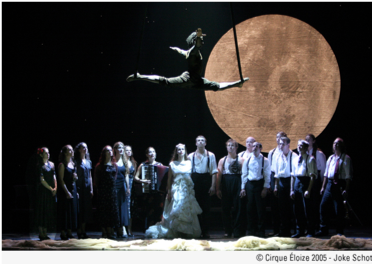 Cirque Éloize and Cirque du Soleil joined forces in a strategic collaboration which lasted six years. Painchaud said it is because of the loss of Hamelin and Finzi Pasca that he approached Cirque du Soleil with a strategic partnership plan. He explained that while the plan looked great on paper it was tricky to put in to action. Upon reflection, Painchaud admits that Cirque du Soleil was very helpful with business tools and organization but both companies were ultimately forced to admit that artistically they had vast differences in their corporate identities. To Painchaud, this started the big process of reaffirming Cirque Éloize’s identity. Cirque Éloize officially opened the the 1st edition of Montreal Completement Cirque Festival with iD. The show was in a big top. 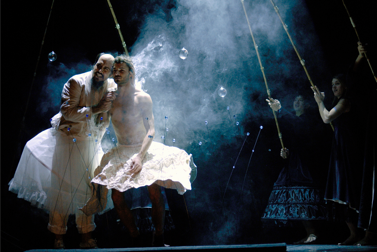 CIRKOPOLIS won a Drama Desk Award in the category of a “unique theatrical experience” in New York. After this, iD co-directed a creation with a choregrapher and did a run at Skirball NYU in New York City. This three week run was of the show CIRKOPOLIS. 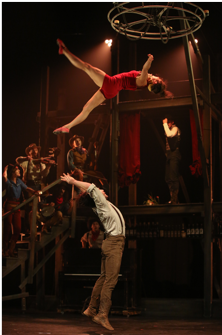 Cirque Éloize opened SALOON, a musical acrobatic adventure, in London. The idea behind it was inspired by Painchaud’s memory of chidhood celtic and country music. He invited his cousin, a musical composer with background in strings, to collaborate. Painchaud decided to create a more American style show after doing a lot with European people, although he invited a European (Emmanuel Guillame, also director of HOTEL) to direct it. Painchaud said the power of this show is that it bring the music back on stage–including a banjo, piano, singer. He also affirmed that many US markets are more curious about this show, perhaps because of its western theme. 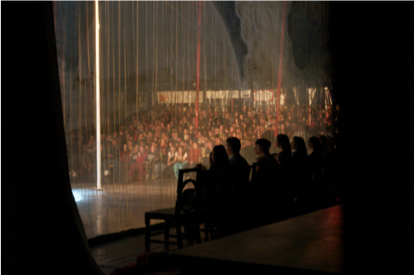 The opening of NEZHA is Cirque Éloize’s first resident show in a circular outdoor amphitheater. The world premier was on July 5th. Billed as a family show with moving seats, it is set in a Disney-style fantastical world with Asian inspired music. For their 25th anniversary creation, there is HOTEL. Set in a familiar place for Cirque Éloize, the hotel lobby. After traveling around the globe 35 times as a whole, Cirque Éloize is embracing memorable characters and events from the lobbies around the world, using 1930’s style vignettes. The show is very musical, featuring electro-swing jazz, and circus artists who take a break from physical feats sometimes to whip out musical instruments and join in. OSM (The Orchestre Symphonique de Montréal) : Cirque Éloize relaunched the idea of mixing classical music and circus arts and runs this show from their special events department. 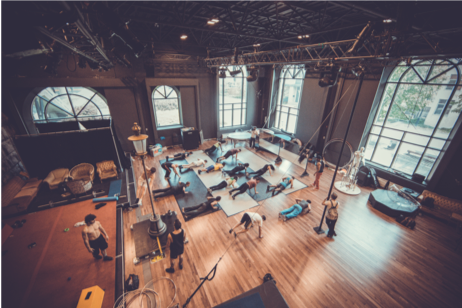 Every year, Cirque Éloize produces 100 special events of all kinds, from weddings to corporate events and parties in their studios. This project is with the music of Rimsky Korsacov, La Minuet Nuit. It is a good example of the many special events they do, which accounts for 25% of their annual income. A book about the 25 year history of Cirque Éloize will be published at the end of 2018. This retrospective will be written by Pascal Jacob (author of over 30 circus books) and called “Generation Éloize”. Painchaud says he chose Jacob because he wants Cirque Eloize to be viewed in the context of global circus history. 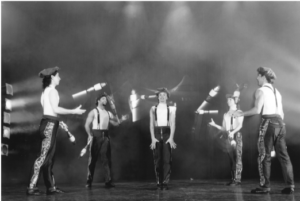 The book’s purpose is to discuss the new vision of circus that they helped to form, and just like this brief retrospective, it will celebrate big moments of 25 years of creativity! Cirque Eloize Show Saloon Goes Western. All photos courtesy of Cirque Éloize. Special thanks to Alizée Lampire for collaborating on this project.